Sometimes I just crave a potato gratin. A cheesy, creamy potato gratin. It’s just pure comfort food. 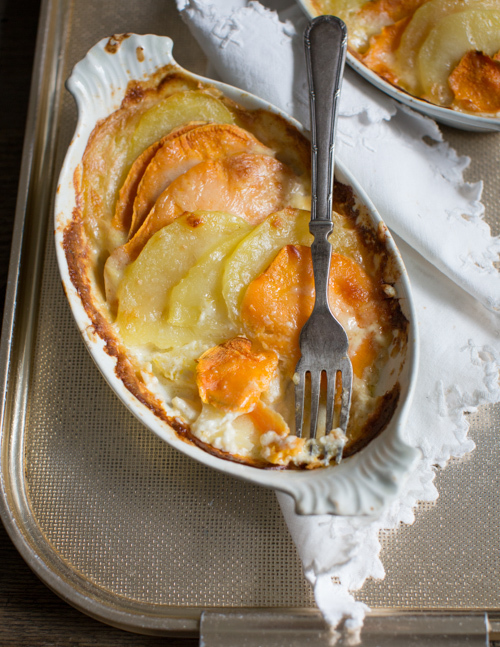 Now, imagine taking the humble potato gratin a notch up. 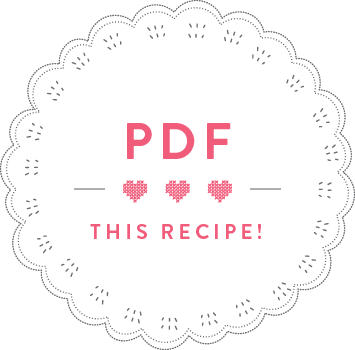 You add sweet potatoes to it. You infuse the cream with rosemary and garlic. And you pimp the whole thing with gruyère cheese. 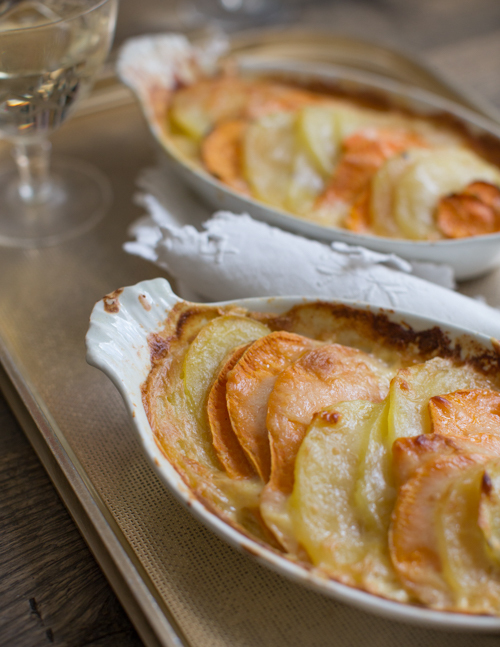 *Boom* You get like the most amazing potato gratin ever! Trust me, this one will rock your world! Preheat the oven to 170 ° C fan. Peel the sweet potatoes and potatoes, cut them into thin slices of 3 mm, preferably with a mandolin, and put them in separate bowls. Grate the cheese and put in a bowl. Peel the garlic, cut it in half and put it in a saucepan with the rosemary branches, cream, milk and salt. Heat the liquid and let it boil for 2 minutes. Remove the rosemary branches and the garlic. Add the potato slices to the liquid and boil for 2 minutes. Take the saucepan off the hob and divide half the potato slices between 4 gratin forms. Sprinkle some gruyère on the top of the potatoes, then distribute half of the sweet potatoes on top and sprinkle them with the leftover cheese. 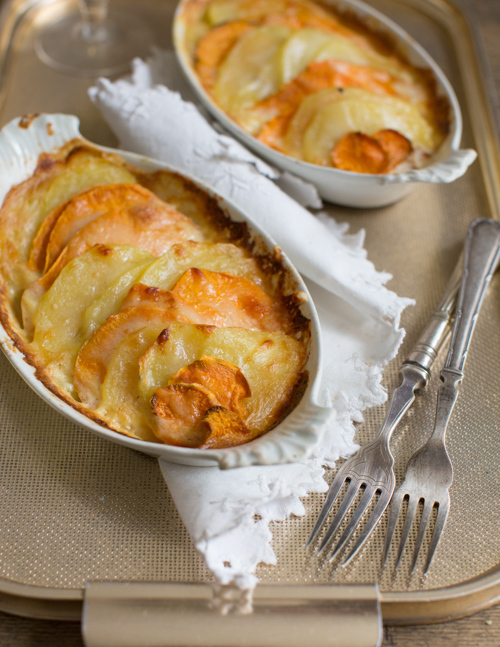 Continue with the remaining ingredients and finish by pouring the creamy liquid onto the gratin forms. 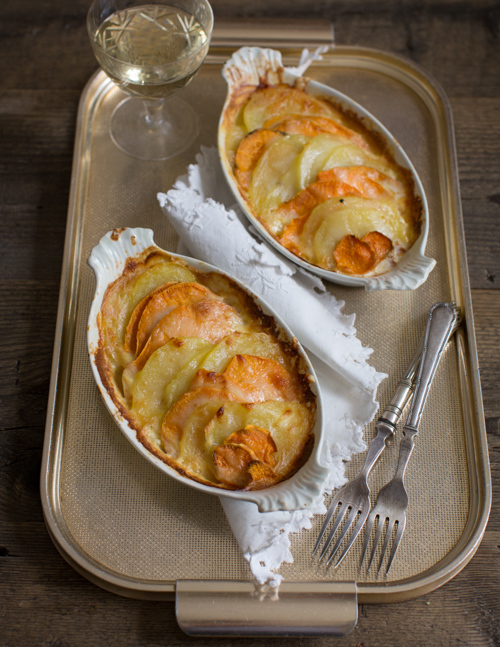 Bake the gratin in the preheated oven for 35 minutes while covering it with foil for the first 15 minutes. Serve the gratins with green salad.